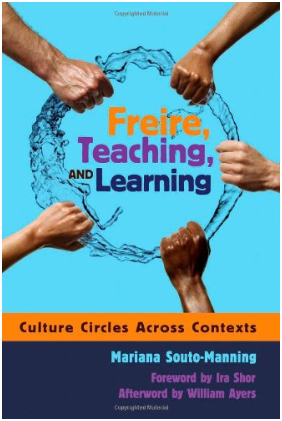 I’ve been reading Mariana Souto-Manning’s book on Freire over the weekend. I found the book thanks to a serendipitous reference in a student’s essay that I was marking. It has been a long time since I read anything related to Friere and this book was like meeting an old friend again, one who had travelled far and been changed in subtle ways by the journey. Both of us older, a little wiser, re- shaped by new sights, new friends, new experiences and new conversations we re-connected. Despite the new layers, there remains an underlying connection to our shared history. I first met Freire’s ideas when I did my Master’s degree. The paper came hot on the heels of a feminist, post-structural paper and in an unexpected way actually meshed quite well. I was ready to learn about a real struggle for self through education. Freire’s work has much relevance for educators. His focus is on equity and democracy. If these principles are at the heart of what we do as teachers then there is no room for disenfranchisement, failure, or violence. No room for exclusion, racism, or oppression. I’ve been reading Lyon’s fascinating book lately. He discusses some reasonably well known topics such as technological developments regarding books; things like changes in binding and printing and the development of text conventions. The area which I found fascinating was the commentary on what it meant to be a reader at different points in history. Lyons documents reading from the preserve of a select few to contemporary widespread practice. He writes about the difference between traditional intensive reading and newer forms of extensive (but often shallow) reading. Lyons, M. (2010). 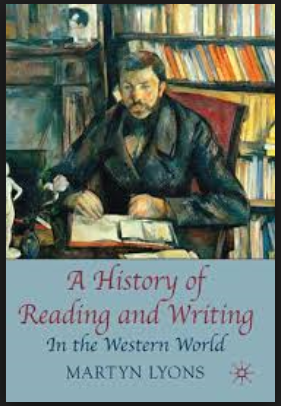 A history of reading and writing in the western world. Basingstoke, England: Palgrave Macmillan.